And I say also unto thee, that thou art Peter, and upon this rock I will build my Church; and the gates of hell shall not prevail against it. And I will give unto thee the keys of the kingdom of heaven: and whatsoever thou shalt bind upon earth shall be bound in heaven: and whatsoever thou shalt loose on earth shall be loosed in heaven. He had indeed failed. Accused by Jewish scribes of blasphemy, Jesus Christ was crucified by Roman soldiers on the mount of Golgotha. To all appearances the son of a Jewish carpenter from Nazareth, he claimed to be the Son of God, and for this he died in dishonour on the Cross. But something unheard of happened: three days later, when some women went to his grave to anoint his body with oil, they met an angel who said to them: "... Fear not ye: for I know that ye seek Jesus, which was crucified. He is not here: for he is risen, as he said..." (Matthew 28: 5—6). 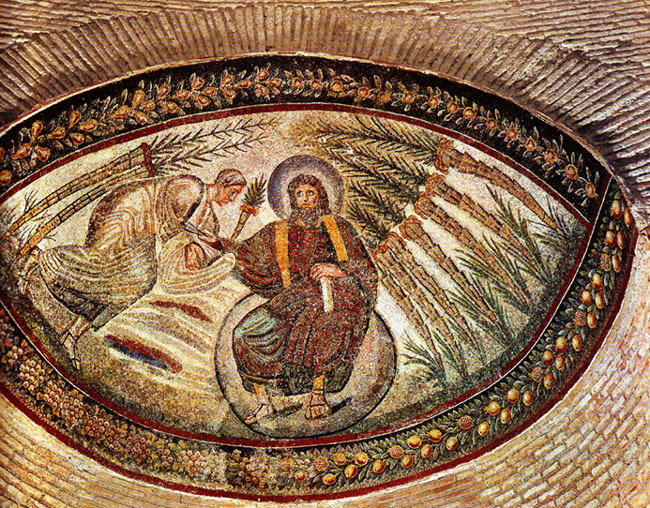 Was Jesus Christ really the Son of God? Certainly his adherents grew in numbers so rapidly that there were soon several thousand of them. The leader within this first Christian community was Simon, a fisherman from Capernaum. It was Simon whom Jesus Christ renamed the "rock" (Greek: Petros) on which he would build his Church. Our picture shows this scene: Jesus Christ has just made Peter the head of his Church — the first Pope. Yet Peter had much to overcome and undergo. Forced to flee Jerusalem in AD 42, he carried his missionary activities as far as Rome, where Christians were soon to be persecuted. They refused to practise the cult of worshipping the Emperor, and were therefore regarded as godless, which provoked the hatred of the pagans. Christians were accused of the most evil and shameful things: "When the Tiber rises to the city walls, when the Nile does not flood the fields, when there is famine and disease, the cry immediately goes up: 'the Christians to the lions'," wrote the Roman historian Tertullian. Peter himself was martyred — crucified upside-down — in 64 or 67, on the place where St Peter's Cathedral stands today. Constantine the Great was the first Roman emperor to be baptised — presumably shortly before he died — and this made it possible for Christianity to become the state religion of the Empire. Early in the fourth century a mausoleum was built on the Via Nomentana, probably as a tomb for Constantine's daughters Costanza and Helena. 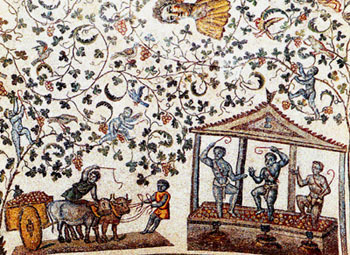 Today known as Santa Costanza, this round structure is one of the oldest and most significant religious buildings in Rome: here mosaics depicting secular events, such as the grape harvest, can be viewed as well as the finest surviving examples of early Christian art, after the catacombs.